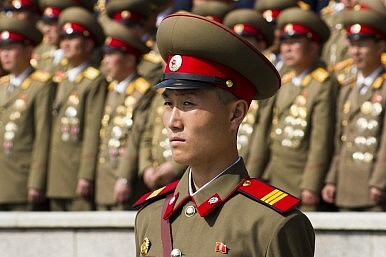 The army and people of the Democratic People’s Republic of Korea (DPRK) are no longer what they used to be in the past when they had to counter the US nukes with rifles. North Korea… is the invincible power equipped with both [the] latest offensive and defensive means unknown to the world. However, South Korea and the United States appeared unimpressed by the North’s bellicose rhetoric and commenced the military drill today. According to Yonhap, Admiral Choi Yoon-hee, the head of South Korea’s military, ordered South Korean forces to “retaliate more powerfully and resolutely against any enemy provocation” during the UFG exercise. “The (South Korean) military is standing with a war-readiness position under which any types of North Korean provocations could be retaliated against strongly at the spot,” another South Korean military official resolutely noted. The military drill, involving 80,000 troops from South Korea, the United States, Australia, Canada, Colombia, Denmark, France, New Zealand and the United Kingdom, will last for 14 days and end on August 28. According to South Korean media, it is the largest computerized military exercise and simulates the defense of South Korea against attacks from the North. The aim of the drill is to “to enhance … readiness, protect the region and maintain stability on the Korean peninsula,” according to a statement from the Korea-U.S. Combined Forces Command quoted by CNN. North Korea will in all likelihood test-fire missiles during the drill. Back in March, Pyongyang fired two ballistic missiles into the sea in order to voice its discontent over two South Korean-U.S. military exercises that took place in March and April 2015. North Korea has already designated the next 14 days as a special vigilance period, according to Yonhap.